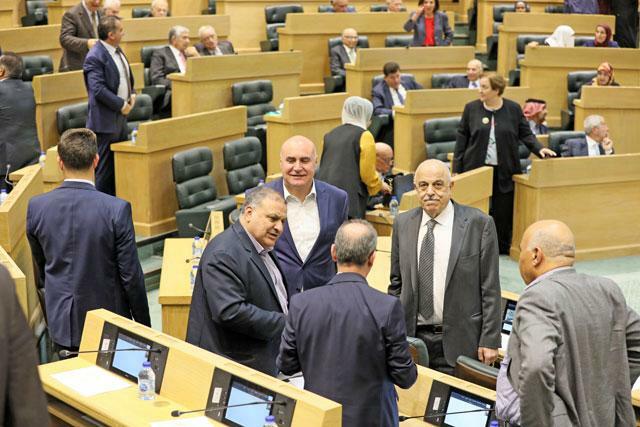 AMMAN — The two chambers of Parliament on Monday endorsed amendments to the Personal Status Law (PSL) setting the marriage age in exceptional cases at “turning 16 years old”, which can be legally applied a day after completing 15 years of age. In a joint session headed by Senate President Faisal Fayez, following a dispute between the Lower and Upper Houses over the bill, the two houses also voted against including the children of a daughter who died before or at the same time of her father in the “mandated will”, the Jordan News Agency, Petra, reported. The joint session resulted in adopting the version of the bill endorsed by MPs. The 2010 temporary PSL allowed marriage exceptions for minors who had completed the age of 15, while the amended version endorsed by the MPs late last year allows those who “turned 16” to tie the knot; a change in terminology which meant that, in reality, turning 16 means that the law can be applied only one day after the completion of age 15. Senators rejected the amendments referred by the Lower House, insisting on raising the age of marriage in exceptional cases to the completion of 16 years of age, and also amended a clause related to the “mandated will” or “wasiya wajiba”, by giving inheritance rights to grandchildren born to female children equally with male children, as this right is currently given only to male children. The legal age of marriage in Jordan is 18 for men and women, but the law allows for several exceptions for girls aged 15 and above, if a judge deems it in their best interest. The law stipulates that the judge can approve the marriage of minors when such marriages are considered a necessity to achieve public interest after ensuring consent and free choice. The marriage contract should be under regulations issued by the judge, provided that the married couple is considered fully competent in all issues related to marriage and divorce. According to the Chief Islamic Justice Department’s official statistics, there were 77,700 marriage contracts issued in 2017, of which 10,434 (some 13.4 per cent) involved marriages in which the wife was under the age of 18.